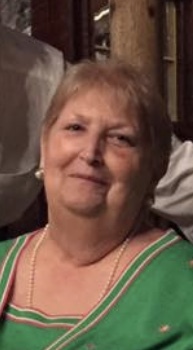 It is with great sadness that the family of Martha Jayne Thompson Lyons announces her passing on December 6, 2018, at the age of 72 years. Jayne will be lovingly remembered by her husband of 53 years, Joseph B. Lyons, Sr. and their children: Kelley Lyons Saneman and her husband Chuck, Joseph B Lyons Jr. and his wife Julie, Kristin Lyons Airey and her husband Paul, Megan Lyons Ivy and her husband Rob, Meridith Chaires Tetrault and her husband Alan. Jayne will also be fondly remembered by her fifteen grandchildren, JP, Bailey, Josh, Reilly, Jake, Madison, Brandon, Nick, Hunter, Brody, Jase, Caden, Payten, Maia and Addison. She is survived by her brother W. David Thompson and wife Marilyn, sister Mary Susan Thompson, sister in law Ginny Lyons Welch, brother in law Jim Lyons, III & his wife Rita and numerous nieces and nephews. She is predeceased by her siblings Steve, Mark, and Teri. Family and friends will honor Jayne’s life at the family owned Evans Funeral Chapel and Cremation Services – Bel Air, 3 Newport Drive (Rt. 23 & Rt. 24), Forest Hill with a Receiving of Friends on Friday, December 14, 2018 from 2- 4 & 7-9 P.M.
A Memorial Service will take place at Mt. Carmel Church, 1707 East Churchville Rd. Bel Air, MD 21015 on December 15, 2018 at 2:00P.M. In lieu of flowers a contribution can be made to (click on paypal) Paypal in the name of our attorney, who will be managing the family’s affairs, to help cover extensive medical expenses.